Terms used by everyone from Rex to thee. Many Yankee traders will awaken at home the week after Mardi Gras, with moss-stuffed voodoo dolls staring at them bewilderingly from atop their desks and computers. They danced with our musicians, dined with our chefs, envisioned Life's offing with thoughts from our artists, captains, and dockside philosophers. Then they danced off home with our rhythms and slang bouncing in their ears, and a peptic re-flux marching in their tummies. 2018 is one of the shortest of the next ten years. 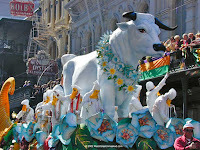 Shrovetide (les Jours Gras) ~ The last three days of Carnival Season. 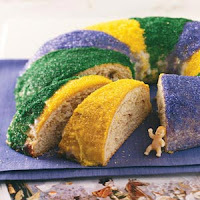 Sunday is for going to Mass; Monday and Tuesday are called Lundi Gras and Mardi Gras ~ Fat Monday and Fat Tuesday respectively ~ and they are for everything you probably think Carnival is about. "It moves," L. A. Norma says, "it's alive!" 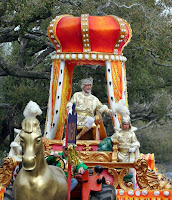 Movable tableau on Carnival Day (Mardi Gras) are the funniest. 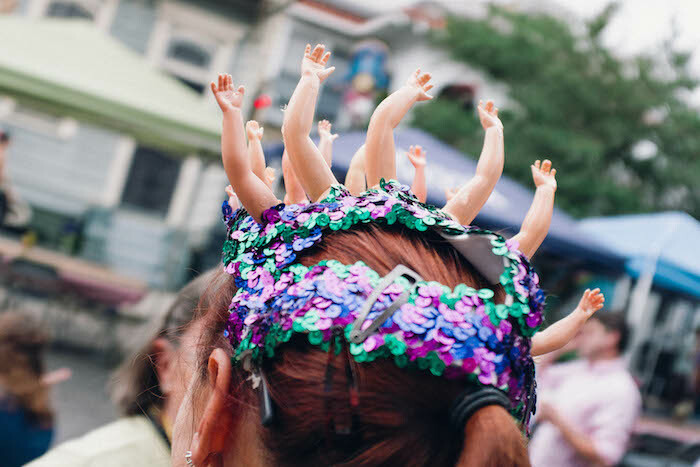 Who can forget the Westbank Big Hair Emergency Repair Krewe marching along, stopping to fix misshapen bouffants along parade routes of yore? 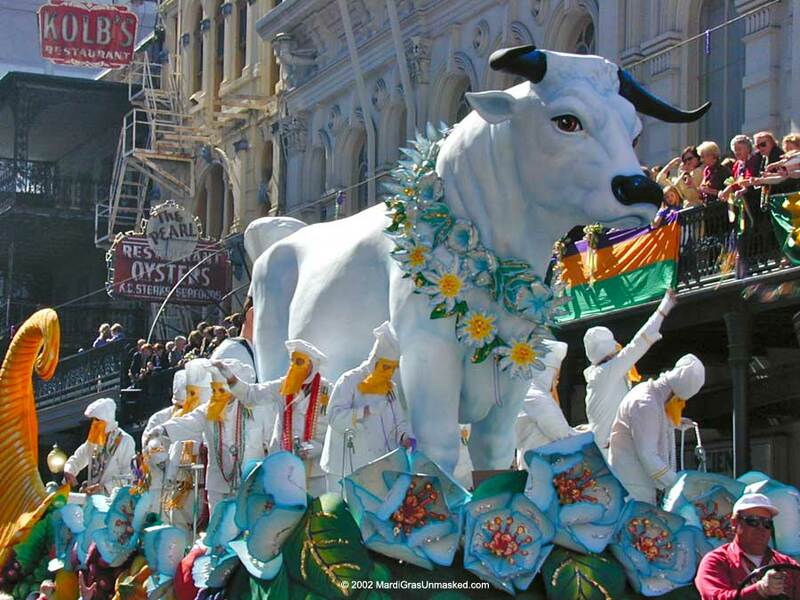 Boeuf Gras ~ The fatted bull or ox ~ in the Rex parade ~ representing sweetly excessive death-to-the-fat, and the beginning of Lenten abstinence (true death). 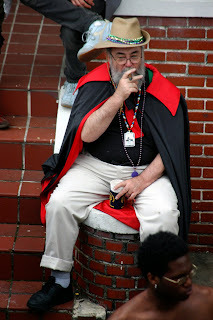 Said by journalists-emeriti and Mardi Gras overseers Arthur Hardy, and Errol Laborde to be the most photographed sight of Carnival. 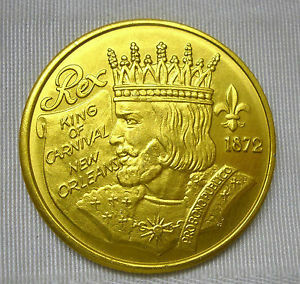 Krewe insignia on one side and the parade theme on the obverse. 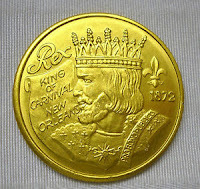 Doubloons were first introduced 1959-60 by New Orleans artist H. Alvin Sharpe. 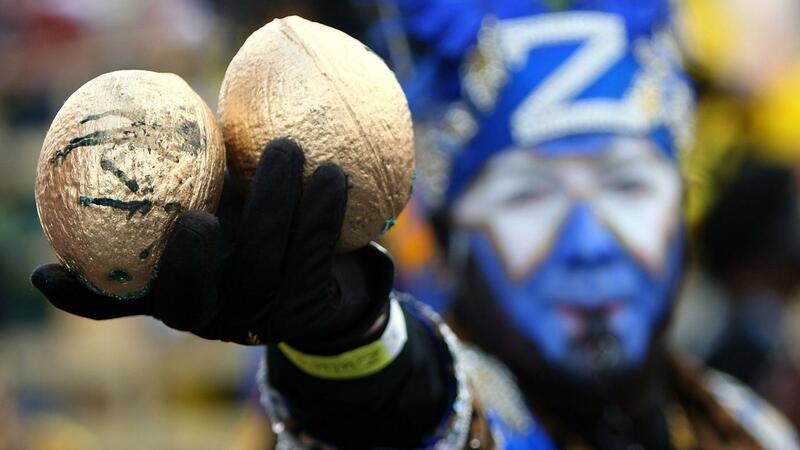 They were gold colored aluminium and first thrown by Rex in 1960. For a few years they were generically called Rex Doubloons. Today doubloons are thrown by many krewes in various colors, themes and names. in Mardi Gras tricolor, with a plastic baby doll hidden inside. It is called 'King Cake' because it commemorates the visit of the Three Kings to see the baby Jesus, a Christian epiphany. as we see it in New Orleans, both! The person who finds the doll is crowned "King" and buys the next colorful cake and gives the next party. Originally parading on foot on Mardi Gras Day behind Rex, today they ride the Saint Charles Streetcar in colorful costumes, on Epiphany night. Sometimes with brassy music. Around car stops and the Car Barn can be good spots to see this first-of-season show. Each year since ~ aboard separate vessels, and for the last few years, Rex has come on the streetcar. Zulu and Rex arrive at Spanish Plaza and greet each other, at the foot of Poydras Street. Comus ~ One of the oldest krewes. First paraded in 1857 ~ four years before Secession ~ with the parade theme: The Past, The Present, The Future. Henri Schindler, Carnival Artistic Designer (an unlikely job description in Minnesota!) 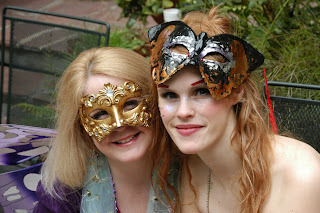 makes a touching statement on the meaning of Mardi Gras in New Orleans old line artistic circles. 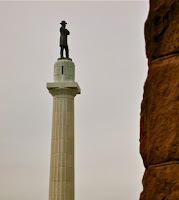 The obelisk commemorates the bloody battle of 14 September 1874. 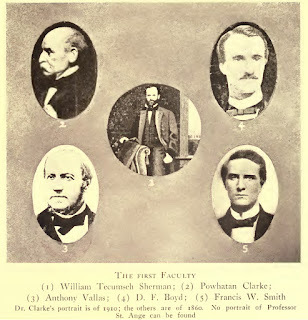 It was part of a terrorist plot that removed the elected governor, William Pitt Kellogg. 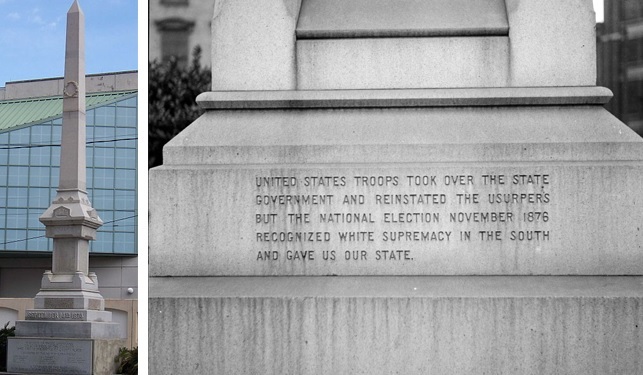 The inscription on the monument refers to the National Elections two years later ~ 1876 ~ as the moment that ended failed-Reconstruction, and united Louisiana White Supremacy with Yankee Jim Crow Laws. Names of whites, "cop killers" fallen in the battle, were inscribed in the stone. Names of fallen blacks, sworn policemen, were not. For three days, in 1874, Governor Kellogg and his cronies (krewe?) took refuge in the recently built U. S. Custom House and Post Office, a handsome Union thumbprint first occupied in 1856 ~ as war clouds gathered ~ and serving through the Nineteenth Century (including the years of War Between the States) as the U. S. Post Office and U. S. Custom House. Remember NOLa spent The War occupied, having surrendered one year after Sumter (April 12, 1861) to the first Yankee reaching the steps of Gallier Hall, on April 29, 1862. Hell, even President Grant wants this, they reckoned. 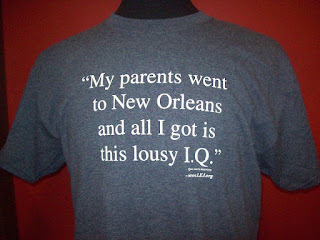 Because, an ill-functioning Port of New Orleans makes for an ill-functioning Western Expansion of the United States. And if the Louisiana Purchase! Hell, the very War Between the States, itself, were for anything ~ more than evil slavery ~ it was for this! Grant would be too! So felt the White League-rs, anyway. It was, however, reestablishment of a new Confederacy they were talking about, though this time aligned more with Washington and less with London. Earlier masterminds had even sent a delegation to plead their case before Ulysses S. Grant, recently home from The War, and newly elected to steady the wheel of the US ship of state. They told President Grant their Big Swamp City, port of New Orleans would make a fine seat for this new Confederacy. Grant reasoned he must now send in troops to free Governor Kellogg. He said no, to the boys from Louisiana, and sent them safely home to moan and groan over their grillades and grits for the next century and a half. One wonders if Grant might have hanged them ~ it was surely treason they were preaching. Or if they were civil and polite at a sociable meeting that might have taken place at the Willard Hotel? Did they drink whiskey? We figure Grant did. 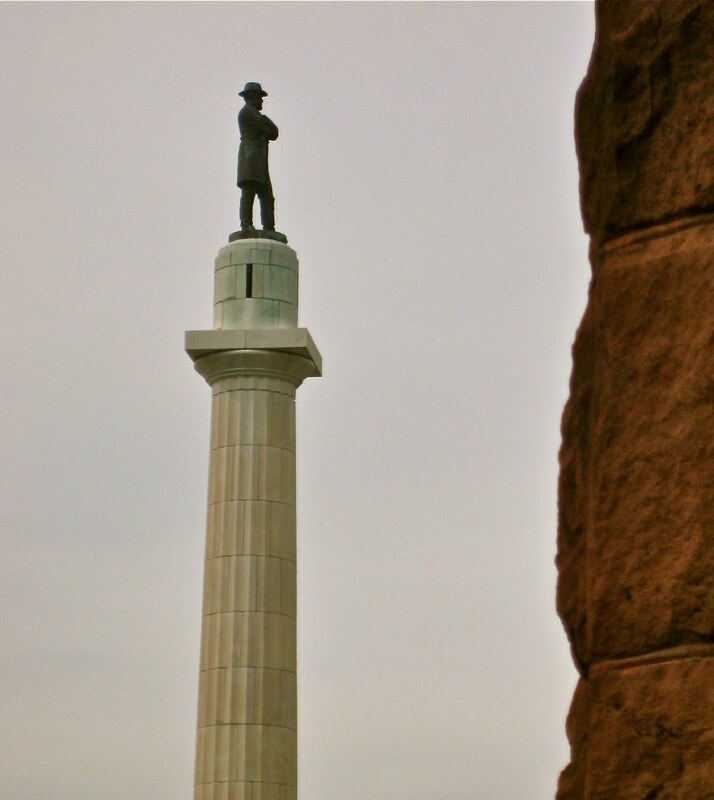 Did any of the Louisiana boys visit the famous pleasure houses of the victorious capitol? Some of the men in the Louisiana delegation were from Grant Parish, founding site of the Louisiana White League. 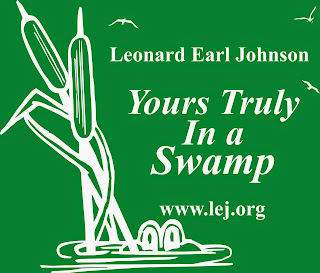 Grant Parish was a 1869 "Reconstruction Parish" (there were eleven such parishes created from what had been Winn and Rapides parishes before The War). Grant Parish is in an English part of Louisiana ~ around Alexandria and Pineville and where William Tecumseh Sherman once lived. 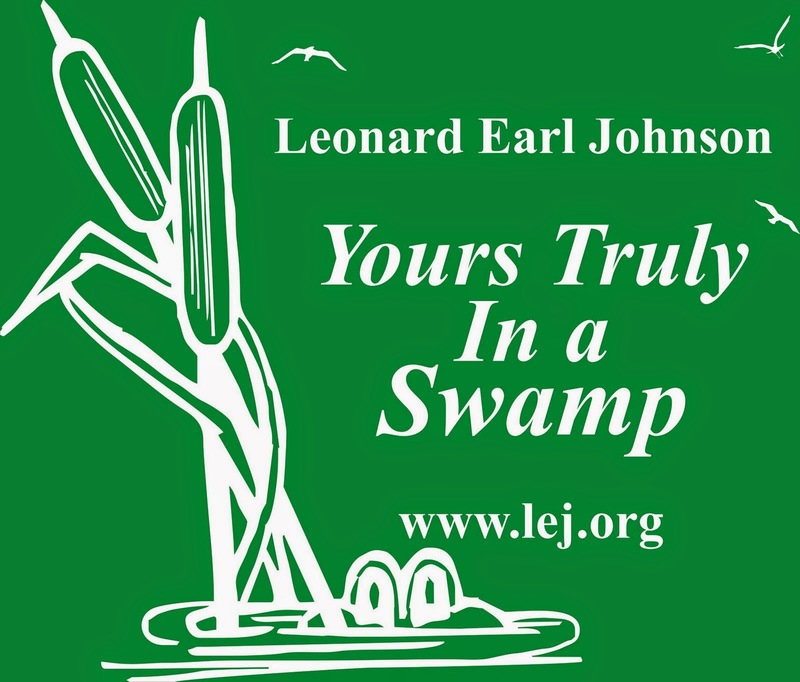 "That's why Piyush 'Bobby' Jindal, and his Republican groomers thought they could starve L. S. U." "Pleasing both D. C. handlers, and the Rome-burners they cheer back-home." "Bobby Jindal burned Baton Rouge!" "You can imagine the indignity of a float full of white-faced blacks coming up behind your Fatted Ox throwing coconuts!" Norma says this to visitors as she blows Camel Cigarette smoke in their faces ~ this time of year likely laced with medicinal Marijuana. 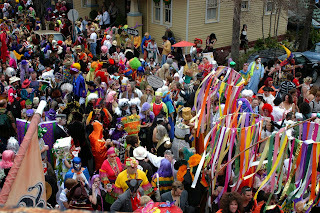 It should be noted that in New Orleans one often hears it said, The City lacks civic energy to do anything but Carnival ~ a self-deprecating humor spoken with love and open pride. Still it is not unheard of to entertain more than one festival per town. Lafayette, Baton Rouge, and New Orleans have them almost weekly. The most notable Louisiana Carnivals outside of New Orleans massive effort is the Courir de Mardi Gras. 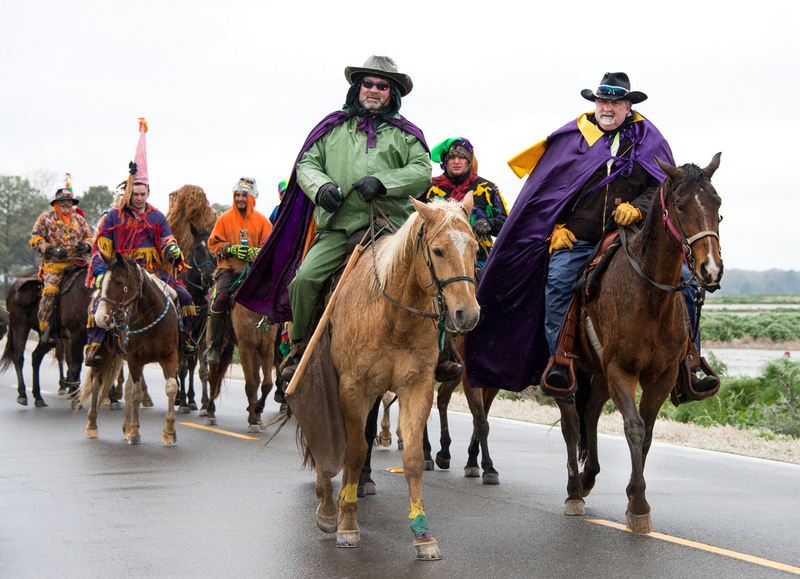 These are events where participants ride horseback from house to house asking for contributions to the communal gumbo pot. Among the items given will be a live chicken or two. A grand drunken chase ensues. Hardly anyone is injured if you do not count the chicken. We who know better know Carnival is a participatory thing. Take another turn round the dancefloor, Louisiana, them smart folks are watching us again. And if you happen to be one of those 'smart and glum' watchers, perhaps you should consider Mobile, Alabama ~ New Orleans' Carnival Mother ~ their Carnival is boredom-friendly. 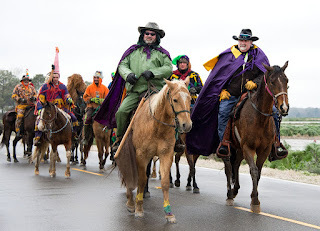 We rode off on another horse, grew grander than hoped, and party harder than expected, until the Purple Vestments come out in the Cathedral on Ash Wednesday. "And a 'moon pie' here is an entirely different thing in Mobile." Contact me if you want on the list that may get e-mailed.